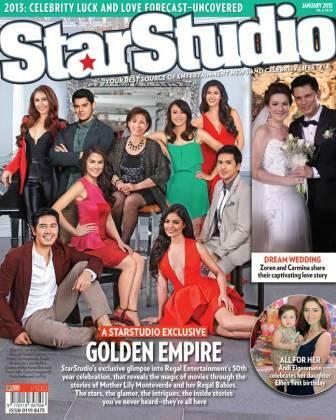 StarStudio Features the 50TH Anniversary of Regal Films! StarStudio opens 2013 with a salute to Mother Lily Monteverde and Regal Films on the occasion of the movie outfit’s 50th anniversary. The issue is packed full with photos and inside stories that give an exclusive look into the Regal empire, from the time of the Regal Babies of the 80s to the present. Regal Babies Richard Gomez, Snooky Serna, Maricel Soriano, Dina Bonnevie, Paulo Avelino, Marian Rivera, Carla Abellana, Dennis Trillo, Solenn Heussaff, Lovi Poe and Richard Gutierrez, as well as industry friends, film directors, and partners come together to share their experiences working with Mother Lily and Regal Films. This special year-starter issue also contains features on the Carmina-Zoren surprise wedding, the first birthday and dedication of Andi Eigenmann’s daughter Ellie and predictions on the fortunes of your favorite celebrities in 2013, the Year of the Water Snake, by top Feng Shui expert Marites Allen.